It appears that the campaign to end OB’s marshmallow wars is gaining momentum. 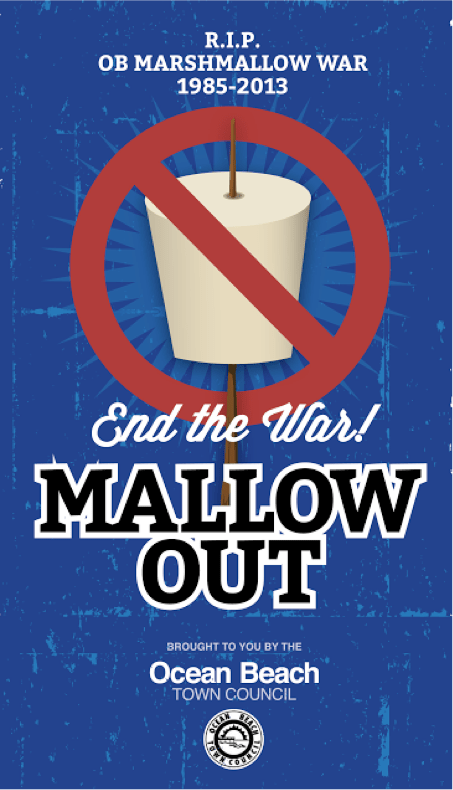 The campaign – led and organized by the OB Town Council – centers on a “Mallow Out” pledge effort to not use or buy marshmallows on the national holiday. It was announced at last night’s OBTC meeting that Newport Avenue merchants have promised to limit marshmallow sales on July 4th. As the Town Council volunteers gather their pledges, Councilman Ed Harris has come out in support of their effort. His community rep, Chet Barfield, informed the audience at the OBTC meeting. Harris wrote a letter to local OB businesses, Barfield said to get them to cut down on bulk sales of marshmallows. Harris’ office, he also stated, is working to get city street sweeper trucks to be out in force along the beach right after the OB Fireworks end in an attempt to dissuade any marshmallow revelry. Plus, Harris is adding grease to the Town Council’s effort to get the word out to not only OB but to the entire City that the community is asking everyone not to get involved. “Enough is enough,” was said multiple times by various Board members last night as the Council gave an update to its campaign. Plus, he added, “the clean-up the next day is atrocious,” and went on describing that the next day all the names on OB’s Veteran Plaza are covered in an inch deep gooey substance. Dave Cieslak also spoke on the Council’s campaign. He spoke of all the complaints the council heard last year just before they passed their resolution banning the marshmallow wars. They did polls, he said, and “the overwhelming response from the community was ‘let’s end this,’ “. “We’re asking people to leave their marshmallows at home,” Cieslak said, and added that they are planning on having a press conference about the campaign, ban and pledge on July 1st at 10am, with the police and merchants. Local TV stations have also discovered the Town Council’s efforts and were out in force at last night’s meeting. There were four cameras present – all for the marshmallow controversy. Here’s their takes: CBS8 , 10News , and Fox5 . Council reps went on to explain the progress of the “Mallow Out” campaign. They’ve had a great response from businesses when they asked them not to sell the white globs. All liquor stores on Newport Avenue, in fact, have signed on to the pledge. Steve Grosch said that the OBTC is still working with Rite Aid and they have agreed not to sell on July 3rd or 4th, and will only have a small stock on hand. The campaign is trying to get Stumps to have a one bag limit on sales on the holiday. The following stores have signed the pledge not to sell: Newport Liquor, Pat’s Liquor, OB Quick Stop, and Olive Tree Market. To some laughter, Grosch added that they want people to actually buy marshmallows to get them off the shelves and donate them to charities. Also, at the suggestion of the police, the OBTC is trying to mobilize people to wear the “Respect OB” T-shirt and go in amongst the crowds on the 4th and talk to people who have marshmallows about what happened last year. This “Peace Patrol” will have an orientation on July 2nd at the Vets’ Plaza. A Surfrider representative also got up before the crowd and announced that they fully support the ban. Several people asked the audience members to join the clean-up organized by Surfrider the day after, on July 5th, at the OB Pier. For the last 2 years, over 2,000 pounds of trash, garbage and stuff has been collected off OB’s beaches on the days after the big shindigs. Lifeguards will be asked to announce the ban on marshmallows during the day on the beach on the 4th as well. For more info, go to the OBTC website. I think it was a great Town Council meeting last night. It’s cool that everyone is willing to work together to try and make this better. For those of you looking for something exciting to do on the Day After, Surfrider will have a volunteer table set up on the grassy area near Veteran’s Plaza starting around 8:00 a.m.. We will hand out all the supplies needed (except for the street washers) to tidy up the beach–including gloves, bags and grabbers. We will also have sunscreen, energy bars and water. All are welcome to attend and assist! What will OBTC say to the reporters who come to them on July 5 to ask them how things went so wrong? It appears they already know that their “ban” is going to fail, they’re planning the cleanup crews. Hope there are also ambulances on standby for all the injuries. If you live west of Sunset Cliffs, you may also want to board up your windows and park your car over on Ebers or Froude or someplace. Above all, don’t go near the beach – tear gas is nasty stuff. Glad we’ve made other plans. Here’s a novel idea. If you don’t have anything good to say, then don’t say anything at all. I can’t wait until nothing happens. I seriously come in and read the marshmallow articles just to read you crying. Been living west of Sunset Cliffs and taking my daughter out to watch the fireworks, with one of my cars parked in the driveway and the other in the street, for going on seven years now. Will follow our usual routine for the seventh time this year, and have a great time as always. This year, there will be rock and bottle throwing, fires, overturned vehicles, mass arrests, tear gas, fire hoses, attack dogs, and looting. I can’t wait till July 5 to tell all of you “I told you so”. Maybe next year some of you will wise up. Nonstick spray, not cooking oil. Probably wouldn’t work on masonry, though. They also plan clean up crews at other beaches the day after the 4th because so many people come to hang out and watch the fireworks, this year surfrider will be hosting cleanups at the Ocean Beach Pier, Belmont Park in Mission Beach, Crystal Pier in Pacific Beach and the Oceanside Harbor-it’s not just to clean up marshmallows, it’s for everything. I think it’s great that so many people are signing on to the campaign. It might not end the fight entirely but it will drastically reduce the number of participants and mess. Damn, I just bought nine bags of marshmallows. Here’s an analogy for people who are still too naive or intellectually challenged to “get it”. When I lived in south Florida, there were many old people who drove huge “land yachts”, Cadillacs, Chryslers, Lincolns. Once in a while, one of these old people would leave their car running and in gear, and get out. The car would idle off down the street or across the parking lot at 4 mph. As a witness, you’d have several choices. You could just watch, or not watch. This was the OBTC strategy for the first 30 years of the marshmallow fight. You could stand off to one side yelling “stop!” at the driverless vehicle. This has been the OBTC strategy for the past few years. You could run and jump in front of the vehicle and try with all your strength to stop it. This is the OBTC strategy this year. Or you could run alongside, jump in, and once inside steer or stop the car, or even reverse it. This is the one successful strategy that the OBTC refuses even to consider. There are always nasty comments about not enough trash cans and/or refuse removal activity. Comments often state that the cans and bins were overflowing and that there should have been more of them. Well here’s a novel idea, if the cans/bins are full TAKE YOUR DAMN TRASH WITH YOU!!! You managed to bring it all to the beach/park maybe you should be a mature, responsible adult and pack it out too??!!!! Commenters: We have to caution everyone that some of these comments are getting out of hand. Please say your piece, keep it respectful and civil even if and while disagreeing. Otherwise you will be placed in “moderation” by the editors, which means that your comments have to be approved individually. Also, please see our Comment Policy in the About at the Navigation bar. I agree w/ Frank, so I’m cordially taking my marshmallows to El Centro for a commentary hiatus. As I type I am eating marshmallows, & so I will use the empty bags to pick up trash on the way to El Centro. If they’re minis, save one for your cat. A cat will put on a show with a mini marshmallow. Wow. Really pathetic uppity people telling everyone what to do. The councilmember Harris telling businesses not to sell Marshmallows and using city street sweepers as intimidation devices? Complete nonsense, what a bunch of uppity busy-bodies. Although I do see a lot of negatives about our charming offbeat marshmallow tradition, I think this way of addressing them is dead wrong, doomed to fail, and will cause other issues far more serious. And I’ve said so, over and over, to deaf ears. It’s possible to contain the marshmallow fight to the beach, or even a specific area of the beach, with cordons and signs. No, it won’t work 100%. Yes, it will work better than intimidation tactics. In the future, if the OBTC wants to improve its control over a tradition they did *NOT* initiate, then they need to “jump in” so they can steer. Contact Kraft and get a sponsorship. Contact local fair vendors and arrange a marshmallow festival with marshmallow-themed foods, crafts, games, and a fight area. It’ll either turn the marshmallow fight into a more positive experience, or it’ll kill all enthusiasm for it, either way it’s a win.